Welcome to our local news page! We have 3 local newscasts daily on each station. MONTANA – Governor Steve Bullock today announced that Montana’s unemployment rate decreased by 0.1 percentage points to 3.7% for the month of March. The national unemployment rate was unchanged at 3.8%. Total employment estimates indicate a gain of 326 jobs, while payroll employment posted no change over the month, suggesting that tight labor markets are constraining job growth. Montana’s labor force grew by roughly 100 people over the month, less than the number of jobs added to the economy. Businesses continue to report difficulty finding available workers. The Consumer Price Index for All Urban Consumers (CPI-U) increased 0.4% in March with a sizeable increase in the energy index. The index for all items less food and energy, also called core inflation, increased 0.1% in March. The unemployment rate in Valley County was 3.7%. job-related illness in the line of duty. Firefighters across Montana put their lives in danger and face increased healthcare risks each and every day. With the passage of the Firefighter Protection Act, we are finally showing firefighters the respect and appreciation they and their families deserve. For every firefighter of today and for those who will one day be called to service, this law will protect their healthcare and the well-being of their families when a job-related illness occurs. Dated this 17th day of April 2019. – U.S. Senator Steve Daines and Congressman Greg Gianforte today secured the reinstating of around-the-clock status at the Raymond Port of Entry. Valley County Clean Sweep Day, sponsored by Two Rivers Economic Growth, is Monday April 22nd. They encourage individuals & businesses to join them in cleaning up our city parks, trails, boulevards & public spaces. Call 263-4769 or 230-1426 to get involved or for more information. (Big Sandy, Mont. )—As the Senate gears up to craft next year’s budget, U.S. Senator Jon Tester is leading a bipartisan effort to strengthen rural Amtrak service and hold the Trump Administration accountable for attempts to gut funding for the Empire Builder Line. Tester is pressing Amtrak President Richard Anderson to reaffirm his support for rural Amtrak routes, including Montana’s Empire Builder. In a bipartisan letter, Tester underscored the important role Amtrak plays in rural communities across Montana’s Hi-Line. • Amtrak’s decision to eliminate ticket agents, why did Amtrak calculate totals based on weekly boardings on routes that do not run daily? • Amtrak’s accounting methods used to determine the cost of operating long-distance service? • Is Amtrak planning to alter any long-distance train routes? • Is Amtrak planning to introduce any new short-distance routes? • What basis does Amtrak claim that demand for long-distance service is down, despite usage numbers rising? In all three federal budgets submitted to Congress since taking office, President Trump has gutted Amtrak funding—including a proposal to eliminate the Empire Builder Line. Tester used his position on the Senate Appropriations Committee to successfully fight the President’s proposed plan to zero out the Empire Builder’s funding in this year’s budget. Tester also worked with both parties last year to secure an additional $1.3 billion for National Network Grants that support Amtrak's long-distance service. Tester is demanding Amtrak to respond to his questions by April 29, 2019. The annual awards celebrate outstanding communities, businesses, organizations and people who dedicate themselves to strengthening Montana’s tourism industry. Their hard work directly contributes to the positive economic impact tourism has on local economies across the state. This drama TV series created by Taylor Sheridan and John Linson and starring Kevin Costner premiered in June 2018. Darby and Hamilton are being recognized for their contributions to supporting the production. o	This rural sculpture park celebrates the industrial, environmental and cultural history of Montana. Surrounded by the beautiful scenery Lewis and Clark County has to offer, the sculpture park invites international sculptors to create site-specific work, made of locally harvested material, uniquely inspired by Montana. o	The “Winter in Wonderland” campaign was the first of its kind to provide comprehensive winter trip planning information for the Gardiner area, critical for a summer destination that has a reputation of shutting down in the winter months. o	Sorini recently purchased the Butte 100, a prestigious mountain bike race and an essential event for Butte. The race will celebrate its 12th run on July 27. Competitors come from all over the world and often arrive early to enjoy what Butte has to offer. o	The Shelby Carousel and Rest Area is a wonderful amenity and encourages people to stop and spend time when passing through town. It appeals to history buffs, amusement park enthusiasts and, most importantly, parents looking for family entertainment during their Montana journey. o	Stone is currently a volunteer on the Board of Directors of the Missouri River Country Tourism Region, Two Rivers Economic Growth, Glasgow Downtown Association, Glasgow Tourism Business Improvement District, Montana State Parks and the Montana Lodging and Hospitality Association. Betty facilitates the development of the Glasgow Tourism Business Improvement District and is instrumental in the City of Glasgow’s new brand and wayfinding projects. The Governor’s Conference on Tourism and Recreation is presented by the Montana Office of Tourism and Business Development within the Department of Commerce and continues Tuesday. Montana Fish, Wildlife and Parks bowhunter education course dates have been set for many areas across Region 6 and northeast Montana. All bowhunter education classes are free of charge. Keep in mind that these may be the only/last bowhunter education course available at these sites this year. All students (both youth and adult) must register online at the FWP website: fwp.mt.gov; click on the education tab, then click “hunter education programs.” Next, “Find a class or field course” and search for the available class in your area. Detailed instructions on dates, times, and other information will be found on the registration page. Many classes require students to pick up a manual and complete chapter quizzes before class begins. Hunter and bowhunter education are state-mandated courses, which are taught by dedicated volunteers. 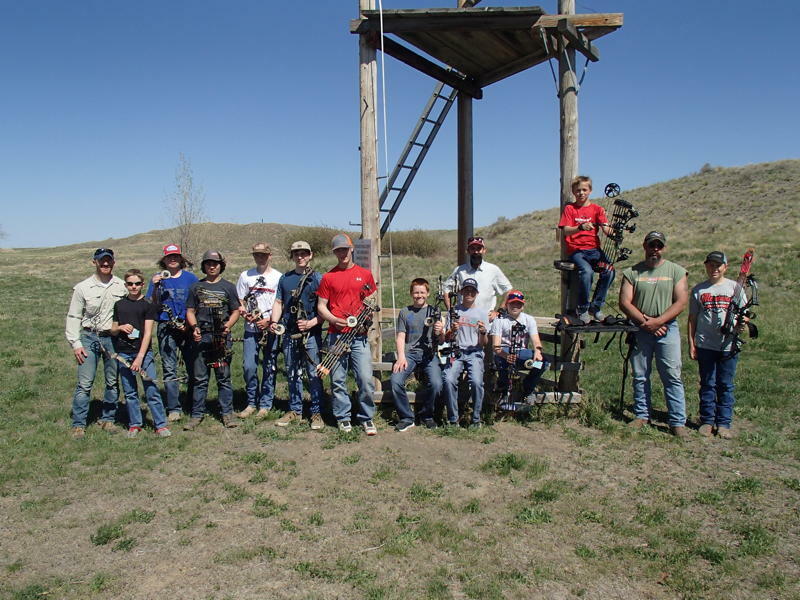 The heart of Montana’s Hunter and Bowhunter Education programs is this group of dedicated volunteer instructors. They stand as examples of how each hunter should demonstrate safety, ethics, behavior, and responsibility to not only themselves, but also to landowners, other hunters, and the resource. Region 6 needs to recruit more of these dedicated men and women to continue to serve the area. Anyone who is at least fourteen-years old is eligible to apply. Volunteer instructors are being sought across the region, which includes the counties of Hill, Blaine, Phillips, Valley, Daniels, McCone, Sheridan, and Roosevelt. For information on becoming a Hunter or Bowhunter education instructor, visit the FWP web site at fwp.mt.gov/education/hunter/instructors/ to learn more and apply. For any information or questions on these upcoming courses or becoming an instructor, please contact Marc Kloker at 406-228-3704, or email mkloker@mt.gov . For youth to be eligible to hunt and be fully certified during the 2019 season, hunters must be 12-years old by January 16, 2020. Students aged 10 and 11 can take a course and hunt as an apprentice but will not be fully certified until the year they turn 12. Preference will be given to 11 and 12-year olds (or older) if the class becomes full. All registrants for these events must be 10 years old by the first day of class. Keep in mind that these may be the only/last hunter education course available at these sites this year. All students must register online at the FWP website: fwp.mt.gov; click on the education tab, then click “hunter education programs.” Next, “Find a class or field course” and search for the available class in your area. Detailed instructions on dates, times, and other information will be found on the registration page. Many classes require students to pick up a manual and complete chapter quizzes before class begins. For any information or questions on these upcoming courses or becoming an instructor, please contact Marc Kloker at 406-228-3704, or email mkloker@mt.gov. The Glasgow City Council on Monday night voted to offer a contract to Anna Rose Sullivan to become the City Attorney for Glasgow pending a background check. Sullivan is a Butte native who currently works for the Law Offices of Terrance Toavs in Wolf Point. She has experience at a Deputy County Attorney for Roosevelt County along with the Fort Peck Tribal Public Defenders Office and the Confederated Salish and Kootenai Tribal Defenders Office. She is a graduate of Gonzaga University and the University of Montana School of Law. Sullivan, upon completion of a background check, will take over criminal and civil duties for the City of Glasgow. The criminal portion had previously been handled by the Valley County Attorney and the civil portion by Glasgow Attorney Pete Helland. Sullivan is expected to practice law in Glasgow once the contract is finalized. The City Council also approved the hiring of Zach Johnson as a Patrolman for the Glasgow Police Department. Johnson is a native of Maryland who upon a background check will become the newest employee of the Glasgow Police Department. Johnson upon a completed background check will attend the Montana Law Enforcement Academy. The City Council approved a contract to Bishop Inc of Malta in the amount of $181,299.24 for the Glasgow Levee Drainage Improvement Project. Jill Page and Pete Helland were reappointed to the Glasgow Recreation Board. The cemetery committee forwarded a recommendation to increase burial rates for the City of Glasgow. The City Council approved an increase of $150 to $350 for a weekday full burial and a $300 increase to $700 for a weekend/holiday full burial. A weekday cremation will now cost $125 and a weekend/holiday cremation will cost $300. Also approved was an additional cost of $150 for a burial scheduled anytime after 3pm all year round, including full and cremation. Judges, foster parents, child protection workers, Court Appointed Special Advocates, youth, business leaders, and private and non-profit organizations will be honored at 10:30 a.m. Tuesday, April 16 at the annual Prevent Child Abuse and Neglect Conference in Helena. The awards presentation will take place at the Delta Hotels Helena Colonial located at 2301 Colonial Drive. Representatives from the Montana Children’s Trust Fund, Montana CASA/GAL Association, and the Department of Public Health and Human Services (DPHHS) will present the awards to individuals from Bozeman, Missoula, Helena, Malta, Miles City, Billings, Butte, Nashua, Kalispell and Hardin. The list of awards includes the Jana Elliott Memorial Resource Parents of the Year. This award goes to the foster/adoptive parent(s) who are committed to excellence in working with birth parents and foster/adoptive children. The award is named after the late Jana Elliott, who served the Wolf Point community myriad ways as both a licensed foster parent and 6th grade teacher. In 2016 the Wolf Point community took a huge loss when Elliott tragically lost her life in a car accident helping someone in need. This years’ recipient are Bryon and Lindsey Gustafson of Nashua. The Gustafsons have been foster parents for the past two years. During this time, they have fostered 11 children. Helm said the Gustafson’s also actively encourage others in northeast Montana to become involved in helping Montana’s children through a program they started this year called Fostering Love. Once a year, the program brings together foster parents, those interested in fostering and several key stakeholders for a couple days of information sharing. The annual Prevent Child Abuse and Neglect Conference brings together hundreds of foster/adoptive parents, CFSD staff, tribal social services staff, county attorneys, judges, counselors, attorney’s and teachers for three days of training and breakout sessions. About 500 people are registered this year. 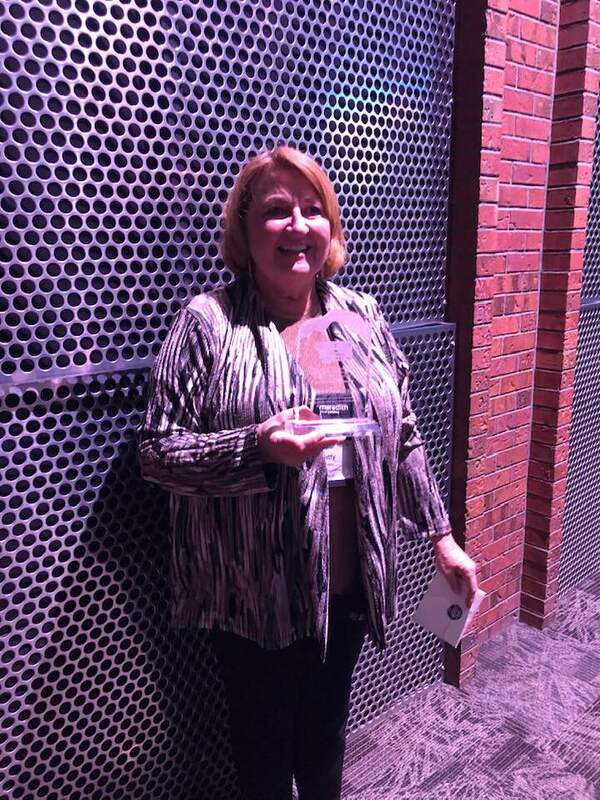 •	Strengthening Families Award, Christina Powell, Bozeman Child Advocacy Center. •	Pinwheels for Prevention Award, Heather Stenson and Barbara Fitzpatrick, Butte 4-C’s. •	Nonprofit Organization of the Year Award, Watson Children’s Shelter, Missoula. Every year, Montana CASA/ GAL Association recognizes outstanding people who have consistently demonstrated a special level of dedication to the CASA/GAL programs and the care and protection of abused and neglected children. •	Judge of the Year, Honorable Judge Yvonne Laird, 17th Judicial District Court, covers Blaine, Philips and Valley counties. •	The Youth Achievement of the Year goes to a foster or adoptive youth(s) who exhibits a drive to be successful and makes positive changes in their life. Jasmine Gruber, Kalispell; Kelly Brown, Kalispell; Jazmyn Saunders, Missoula; Kayce Zachariasen, Missoula; Samantha Gloud, Helena; and Emmanual Eporu, Missoula. •	The Engaging Families in Positive Change award goes to an individual or individuals who works with families to carry out the mission of CFSD in a manner that is positive and respectful of each family’s strengths. Kelly Slattery, Missoula and Jodi Christensen, Kalispell. •	The Resiliency Award goes to an individual or team that displays traits that foster a supportive and positive work environment and that embody a healthy work/life balance. Deanna Hause, Helena, and Samantha Kitzenburg, Hardin. •	The Creative Solutions Award goes to an individual or team that utilizes creative problem-solving and resource allocation to better serve children and families. Kate Larcom, Missoula. HELENA — In 2018, the U.S. Supreme Court struck down a federal gambling law, giving individual states the power to legalize and regulate sports gambling. Now, Montana could join the 10 states that have already passed legislation opening up sports betting. In the Montana Legislature Wednesday, the Senate Business, Labor and Economic Affairs Committee heard testimony on two bills that would legalize sports betting and regulate it through the Board of Horse Racing and the Montana Lottery. Both organizations have no oversight from the Gambling Control Division. Both bills passed out of the House last month, with House Bill 475 passing 87-9 and House Bill 725 with a 88-10 vote. Majority Leader Rep. Brad Tschida, R-Missoula, sponsored House Bill 475, which would expand pool-based horse betting systems into other team sports. “For those of us who don’t bet, it really has no impact on us. For those who like to bet, it’s an opportunity from them to do that in a way that is organized and well maintained,” Tschida said. The second bill heard was House Bill 725, sponsored by Rep. Ryan Lynch, D-Butte, which would allow the Montana State Lottery to offer sports betting, which already offers pool-based betting for football and auto racing. “The reason the Lottery makes sense is that it’s already existing. So we have existing infrastructure that’s been already laid out across the state. What this does would allow the Lottery to authority and the opportunity to offer sports wagering within communities,” Lynch said. There were no opponents to either bill during the committee hearing. (U.S. Senate) – U.S. Senator Jon Tester announced $4.3 million in grants today to increase access to affordable housing in several Montana communities. Housing Authorities in Billings, Great Falls, Missoula, Helena, Butte, Anaconda, Sidney, Glasgow, Whitefish, and Glendive received the grants from the U.S. Department of Housing and Urban Development to help develop, finance, and modernize public housing developments in their cities. Tester has been a strong supporter of expanding affordable housing in Montana and helped secure funding for the grants through his role on the Senate Appropriations Committee. Earlier this year, Tester also helped negotiate a funding deal that makes substantial investments in affordable housing initiatives. Glasgow School District enrollment is down 35 students from last school year according to enrollment numbers provided by the school. The April enrollment count is 842 students compared to 877 students last year. The enrollment count is also down 18 students from the start of the school year in September. The largest class in the district is the 7th grade class with 77 students with the 2nd grade class with 74 students. The smallest class in the district is the 3rd grade class with just 42 students. In other school news, a committee comprised of the Superintendent and 3 representatives from each school have put together a school calendar recommendation for the 2019-2020 school year. The Glasgow School Board will have to approve the recommendation. The proposed calendar would have school begin on August 21st and end May 29th. Christmas break would begin on December 23rd and students would go back to school on January 2nd. The Glasgow School Board will also look to approve health insurance payments made by the school district for employees. The board will be asked to pay $503 per month for each employee. The total cost for health insurance for the school district is $766,572.00 for the 2019-2020 school year. The Glasgow School Board will meet Wednesday night at the District Boardroom in the Central Office. WASHINGTON – Congressman Greg Gianforte and U.S. Senator Steve Daines today sent a letter to Kevin McAleenan, commissioner of U.S. Customs and Border Protection (CBP), demanding that the agency postpone any changes to the hours of operation at four Montana ports of entry. “We request you delay any final decisions regarding changes to hours of operation until June 1st, 2019, when seasonal hours of operation changes are scheduled to take place. At the very least you should delay any decision until actually listening to impacted communities and talking to the people elected to represent Montanans,” the letter reads. Gianforte and Daines rejected CBP’s efforts to put a price tag on maintaining the current hours of operation for the ports of entry. “Your staff have informed our staff that these proposed changes would not result in any employees leaving Montana communities, and would result in reduction in overtime costs of $180,000. Keeping ports of entry open to rural Montana is worth more than $180,000,” Gianforte and Daines write. On March 7, 2019, Gianforte and Daines sent a letter to CBP’s McAleenan opposing reductions to hours of operation at the Morgan, Opheim, Raymond, and Scobey points of entry. CBP has yet to respond to their letter. HELENA – The House gave final approval Monday to a bill that would create presumptive coverage for firefighters under workers' compensation for certain diseases and it now returns to the Senate to have amendments approved. Senate Bill 160, known as the Firefighter Protection Act, was approved in its third reading 89-8. Firefighters and state officials said it has taken nine sessions for this legislation to get passed. State Representatives Rhonda Knudsen and Bridgett Smith voted for the legislation while Representative Casey Knudsen voted no. Senate Bill 171 also passed its third reading Monday with a vote of 83-14. It requires firefighters hired on or after July 1 be tobacco-free. It was sponsored by Sen. Steve Fitzpatrick, R-Great Falls. Representatives Rhonda Knudsen, Casey Knudsen and Bridgett Smith all voted yes on this legislation. Pictured: 2018 "Disney's The Little Mermaid" was a huge success. 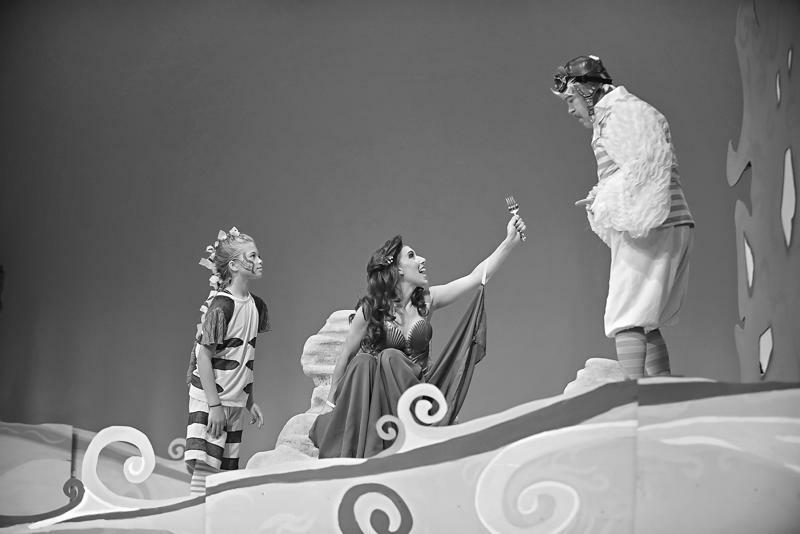 In the photo is Summer Strommen (Flounder), Lauren Paley (Ariel), and the Fort Peck Theatre's Artistic Director, Andy Meyers (Scuttle). Fort Peck Summer Theatre (FPST) is preparing for the 50th Anniversary Season! The season promises to celebrate the history of the theatre and showcase a wide variety of productions, which continue to engage and attract audiences of all ages. Artistic Director Andy Meyers is returning for his 9th season, and is honored to be welcoming back a rich roster of talent, including many alum, audience favorites and local cast members. Back by popular demand, this Tony Award winner opens the 50th season! A legendary farce, set in 1934 at the famous Cleveland Grand Opera Company, this side-splitting comedy features mistaken identity, revolving doors, over-the-top opera personas, and of course a love story! One mother. One daughter. THREE possible dads! This world-wide phenomenon is making it’s FPST debut. Bursting with dozens of ABBA’s famous hits, this spectacle musical is sure to leave audiences dancing in the aisles! Get your tickets now, as this is sure to be a standing-room only production! Written by FPST alum Roger Bean, this smash off-Broadway hit ventures back to the 1958 Springfield High School prom and follows a female singing group, whose hopes and dreams are as big as their beehives and crinoline skirts! The score includes over 30 classic 50s and 60s songs, sure to keep audiences smiling during this must-take trip down memory lane! Peter Pan, Captain Hook and the Darling family come to life on stage in this colorful and extravagant musical. The FPST production will feature high-flying special effects, large athletic dance numbers and swash-buckling pirates, perfect for the entire family! Glasgow native Christen Etchart returns to star in the title role! Audience favorites Pam L. Veis and James Rio play the roles made famous on film by Katherine Hepburn and Henry Fonda. This touching, warm and witty story centers around Ethel and Norman Thayer as they spend their 48th season on Golden Pond! Director Dan Sharkey, who is a veteran of many Broadway productions, including The Music Man, Bridges of Madison County and Spider-Man; Turn Off the Dark, makes his FPST debut! Don’t miss our two exciting Theatre for Young Audience productions for the 2019 season! After a nearly sold-out run in 2018, Alice’s Rockin’ Adventures in Wonderland returns to the Fort Peck Theatre stage June 26, 27, 28 and 30 at 10:00am. Pinocchio will tour to various locations around NE Montana July 9 – July 16. Admission is free for all TYA production. Registration is now opening for FPST’s Annual Performing Arts Camp, held July 30 – August 8. Taught by professional artists from around the county, camp culminates in a showcase performance August 8 at 7:00pm. For more information and registration please visit website. The official 50th Anniversary Reunion Weekend and Celebration is June 28 – 30. Please visit fortpecktheatre.org for exciting information about all the planned events. The weekend will be highlighted by a very special reunion by the original 1970 FPST company, performing their original roles from the first season, in a concert style presentation of OKLAHOMA! The Valley County Sheriff's Office announced that the missing man from St.. Marie has been found safe and sound. The Valley County Sheriff's Office is actively conducting a search for a missing man from St. Marie. According to Sheriff Boyer, 54-year old Wade Simonsen has been missing since last Thursday from St. Marie. Simonsen was going to Power, Montana and left in a charcoal grey 2003 Corvette. He has not been seen since; the last contact was a withdrawal made from a bank in Havre, Montana last Friday. Simonsen is 54 and bald with a mustache and goatee. If you have any information about Simonsen's whereabouts please contact the Valley County Sheriff's Office at 228-4333. The Grobel Scholarship Trust will award two scholarships, each in the amount of $2,200 for the 2019-2020 school year. These scholarships are available to graduates of Valley County high schools who have completed at least one full year of post-secondary education in nursing or other medical related field. Completed applications must be submitted not later than 4:00 p.m. on July 12, 2019. For information contact Jessica Pehlke at the First Community Bank of Glasgow. 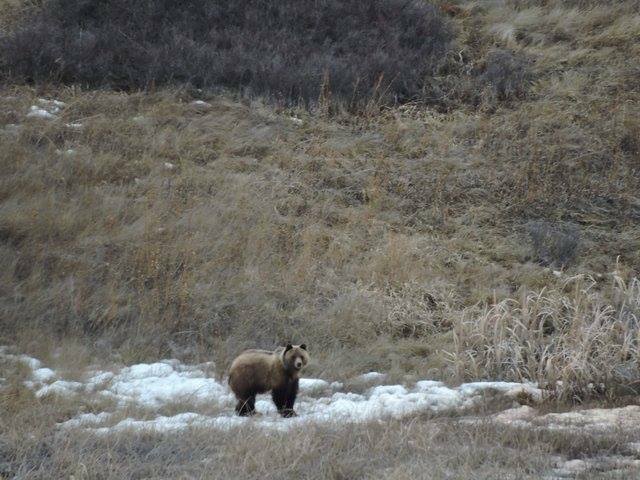 Photo tagline: This subadult grizzly bear was observed 3 miles west of Interstate 15 off the Bullhead road, south of Shelby, on April 7th. Photo courtesy of Dale Seifert. At this public meeting, FWP bear management specialist Wesley Sarmento will present a background on grizzly bears in Montana, how the department manages grizzly bear conflict, and the challenges of grizzly expansion on the prairies east of the Rocky Mountain Front. In addition, Sarmento will explain what to do during a bear encounter, how to use bear spray, how to protect harvested game meat, how to safely deter a bear using non-lethal tools, and how to secure attractants and prevent a bear from being drawn into agricultural operations and residences. FWP encourages landowners, hunters, and any outdoor recreationists to attend. FWP ensures that its meetings are fully accessible to persons with disabilities. To request special accommodations for this meeting, or if there are any questions, please contact 406-228-3700. Recently, Governor Steve Bullock announced that he will establish a Grizzly Bear Advisory Council to help initiate a statewide discussion on grizzly bear management, conservation and recovery throughout the state. The Council will be selected through an application process that ends April 12th. If anyone is interested in this opportunity, please go to the fwp.gov webpage to learn more and apply. BOZEMAN, Mont., April 5, 2019 – The next deadline for Conservation Stewardship Program (CSP) applications to be considered for funding in fiscal year 2019 is May 10, 2019. USDA’s Natural Resources Conservation Service (NRCS) plans to invest up to $700 million for new enrollments and contract extensions in fiscal year 2019. The 2018 Farm Bill made several changes to this critical conservation program, which helps agricultural producers take the conservation activities on their farm or ranch to the next level. NRCS now enrolls eligible, high ranking applications based on dollars rather than acres. For fiscal year 2019, NRCS can spend up to $700 million in the program, which covers part of the cost for producers implementing new conservation activities and maintaining their existing activities. CSP is offered in Montana through continuous sign-ups. The program provides many benefits including increased crop yields, decreased inputs, wildlife habitat improvements and increased resilience to weather extremes. CSP is for working lands including cropland, pastureland, rangeland, nonindustrial private forest land and agricultural land under the jurisdiction of a tribe. 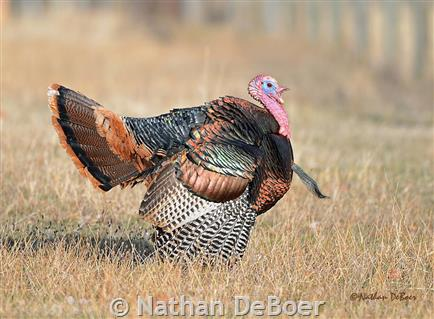 BMA access will be granted through a traditional sign-in box on the properties and will be advertised by a green sign titled “Spring Turkey.” Signing in will allow hunters access only for turkey hunting. Other activities such as shed hunting, fishing, or small game hunting are not allowed. Permission for such activities must be separately allowed by the landowner. The cold, snowy, late winter we’ve had in Region 6 has many citizens concerned about game birds such as pheasants, grouse, and partridge. Although these species are well adapted to make it through even tough winters, there is something landowners can do to help birds next winter- plant a food plot! Montana Fish, Wildlife and Parks has two options to help landowners establish food plots for game birds: standing grain plots and NEW diverse seed mixes. Standing grain plots: For standing grain plots, FWP will pay landowners $150 per acre to help offset the costs of seeding. Standing grain plots are most suitable if landowners have odd field corners or edges of crop fields near dense winter cover that they can leave unharvested. Diverse seed mixes: With our new seed mixes, the FWP is offering free bags of seed that will cover up to 5 acres, and landowners who plant the mixes will still receive the $150 per acre to offset planting costs. FWP encourages landowners to try out the new free seed mixes. They are designed to provide critical brood-rearing cover for game bird chicks in summer, and they contain tall, stiff plants like sorghum and sunflowers that can stand up to snow and provide easily accessible food all winter long. Whether planting one of the new mixes or leaving standing grain, all plots need to be located within ¼ mile of dense winter cover such as a brushy draw, shelterbelts, or a cattail wetland. 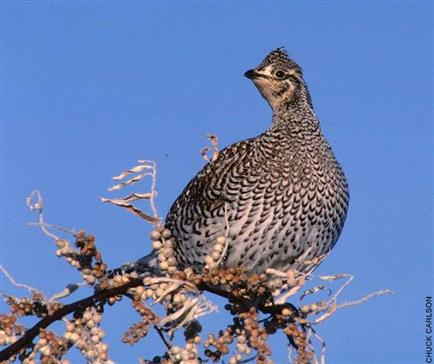 In return for seed and payments, landowners must sign a written agreement to leave the plots standing until the following spring, and to allow some public access for upland game bird hunting in the fall. If you are interested in planting food plots for wildlife this spring, please contact Region 6 FWP Game Bird Specialist Ken Plourde at 406-474-2244 before May 1. Montana Fish, Wildlife and Parks Hunter Education course dates have been set for Wolf Point, starting April 24. The class will be located at the Sherman Inn at 200 E Main in Wolf Point. All hunter education classes are free of charge. All students must first register online at the FWP website: fwp.mt.gov; click on the education tab, then click “hunter education programs.” Next, “Find a class or field course” and search for the available class in your area. Detailed instructions on dates, times, and other information will be found on the registration page. After students have registered for the course, they will need to pick up a hunter education manual at E&C sports or the Agland Farm Store in Wolf Point, read the book, and complete all quizzes before the start of class. The classes will be from 5-9 p.m. April 24-26 and from 8 a.m. to completion on Sat., April 27. Please use the back doors of the Sherman Inn to access the stairs to the basement classroom/conference area, and special thanks to the Sherman Inn for the use of their facility! If there are any questions, please contact course coordinator Shane Reed via the registration page. On Tuesday afternoon, April 2, 2019, after the City of Glasgow completes pumping water for the day, Montana Aviation Research Company, will begin construction work to complete an upgrade to Pump House #1 which provides drinking water to the communities of Glasgow and St. Marie. This construction is planned to take no more than 24 hours to complete. The City and Montana Aviation will not be able to pump water while this construction is taking place. We ask these communities to conserve and limit water use in their homes and no outside watering until the upgrades are completed. We will announce on the KLTZ-KLAN radio stations when the restrictions will be lifted. Luckily, Sullivan said, the family's health insurance covers the cost. But she said that doesn’t solve the high cost itself, meaning insurance companies, Medicaid and Medicare calculate that high cost into premiums. The bill would require drug manufacturers to submit a transparency report that justifies why a prescription has increased in price. The report would be required if a price is increased 10 percent or more, and if the drug costs more than $100. The bill passed its third reading in the House on Monday 75-24 and now goes to the Senate. Sullivan made clear that these reports are for research purposes, not price fixing. She said the bill would help identify the key drivers of drug price inflation. Representatives from the Montana Medical Association, BlueCross BlueShield of Montana, PacificSource Health Plans, AARP and the Office of the Montana State Auditor spoke in support of the bill in a Wednesday hearing in the House Business and Labor Committee. “Seventy-two percent of the respondents were concerned about the cost of the medications and nearly 40 percent of the respondents said they did not fill a prescription because of the high cost,” Vachowski said. Area Representatives Casey Knudsen and Rhonda Knudsen voted against the legislation. Dana Malick, a lobbyist for Pharmaceutical Research and Manufacturers of America, spoke in opposition to the bill. She says manufacturers already offer rebates and discount prices, but that patients don’t see the benefits of those if their insurance premiums don’t reflect the savings. Voters will also vote on a General Fund Levy request during the May 7th election. This election will be a poll election meaning voting will be done on May 7th. The only voters who will receive a ballot in the mail will be those who are registered as permanent absentee voters. Of the 3331 registered voters in the Glasgow School District, 2275 of them are permanent absentee and will be mailed ballots between April 17 and April 22. 31.7% of the voters will not be mailed a ballot and will have to come to the polls On May 7 (noon - 8 p.m.) if they want to vote during this school election. HELENA, Mont. (AP) — The Montana House has endorsed a bill to continue the state's Medicaid expansion program while adding a work requirement. Nineteen Republicans joined Democrats in supporting the measure 61-39 Friday. The bill was to be heard by the House Appropriations Committee Friday and needs a final vote in the House before moving to the Senate. Republican Rep. Ed Buttrey said the program has been a success in improving the health and workforce participation of its recipients. He said his bill improves it by adding work requirements, strengthening an asset test and requiring Hutterite colonies to pay the state's share of their members' coverage costs. Bill supporters rejected numerous proposed amendments during a two-hour hearing. Conservative Republicans argued the bill was brought late, was substantially amended after a public hearing and an updated fiscal note wasn't available. State Representatives Casey Knudsen and Rhonda Knudsen voted against the legislation while State Representative Bridget Smith voted yes. WASHINGTON (AP) — President Donald Trump has issued a new presidential permit allowing construction of the Keystone XL oil pipeline, two years after he first approved the long-stalled project. Trump said the permit issued Friday replaces one granted in March 2017. It is intended speed up development of the controversial pipeline, which would ship crude oil from tar sands in western Canada to the U.S. Gulf Coast. A federal judge blocked the project in November, saying the Trump administration had not fully considered potential oil spills and other impacts. Judge Brian Morris ordered a new environmental review. An appeal filed by the project's developer, Calgary-based TransCanada, is pending. Stephan Volker, an attorney for environmentalists who sued to stop the project, said it was highly unlikely that pipeline work could proceed without court approval. MSU Extension is providing Farm & Ranch families with the unique opportunity to hear from experts in agriculture financial analysis to gain insight & tools to move their operations to a level of improved functionality. Educators from Plank Stewardship Initiative will be in Glasgow Mon. April 1st at 6p.m. at the Valley County Courthouse to share their ideas with those involved in production agriculture. This program is intended to provide agricultural producers with the tools & guidance necessary to conduct a full financial analysis of their operation. There is no charge for this program. For more information & to pre-register, call the Extension office, 228-6241. In an effort to further understand the impact of the proposed adjustment of hours of operation at 4 Montana ports of entry prior to the April 14th implementation, U.S. Customs & Border Protection has scheduled town hall meetings to discuss & receive feedback from the public. The Port of Opheim meeting is Tuesday April 2nd at 5p.m. at the Glasgow Senior Citizens Center. The scholarships are funded by proceeds from the annual Jeff Jurgens Memorial Basketball Tournament, which finished its 21st consecutive year last month. The tournament, as well as the namesake scholarship, are a memorial for Jeff Jurgens, a Glasgow youth and dedicated athlete who died in 1998. In order to qualify for scholarship consideration, applicants must be on course to graduate in 2019 from a Valley County high school. They must also have participated in at least one season of high school basketball or plan to enter a health-related course of study at a post-secondary institution. Other criteria include athletic and academic achievement, community service and leadership, as well as personal integrity. Applications are available from the counselors at any Valley County high school (Glasgow, Hinsdale, Opheim, and Frazer), or by emailing Andrew McKean at montanamckean@gmail.com. House Bill 327 adds a definition for a cell-cultured edible product into the Montana code and redefines hamburger and ground beef to come “entirely” from the edible flesh of a slaughtered animal. Zuri Moreno with the ACLU opposed the bill when it was in committee in February. The bill doesn’t allow cell-cultured products to be labeled as meat, and Moreno said that distinction encroaches on First Amendment rights for free commercial speech. “These restrictions on speech are neither necessary nor appropriate to prevent consumer deception. This bill is an unconstitutional solution in search of a problem,” Moreno said at the February hearing. HB 327 doesn’t address plant-based meat, like a similar billed passed by the Missouri Legislature in 2018. According to NPR, the ACLU, along with three other organizations, filed a lawsuit against the state of Missouri for violating First Amendment rights and attempting to stifle the meat-alternative industry. In Montana, the House voted 92-to-6 this week to adopt Senate amendments to HB 327 that clean up language in the bill. Customs and Border Patrol plan town hall meetings to discuss adjustment of hours of operation and Montana ports of entry. SWEETGRASS, Mont. — In an effort to further understand the impact of the proposed adjustment of hours of operation at four Montana ports of entry prior to the April 14 implementation, U.S. Customs and Border Protection (CBP) has scheduled town hall meetings to discuss and receive feedback from the public. Additionally, CBP has been diligently conducting informative and constructive discussions with staffers from the offices of Sen. Jon Tester, Sen. Steve Daines, and Rep. Greg Gianforte. CBP identified the Raymond, Scobey, Opheim and Morgan ports of entry for modification of operational hours to realign resources to historical and existing traffic volumes and workload. The change in hours will allow CBP to properly align staffing with workload. In doing so, CBP will be able to continue to provide a reasonable level of service to its communities as well as accomplish its mission. Furthermore, CBP will redirect valuable resources and staffing to ports with significantly greater commercial and passenger volumes. Canada will not be aligning hours to match the new CBP hours and will stay open during the hours proposed for adjustment. Trade exports will not be affected by the change. This adjustment will allow CBP to maintain a reasonable level of service at these ports of entry. The Scobey town hall meeting will take place at noon, April 2 at the Richardson Theater located at 105 First Avenue North in Scobey. The Morgan town hall meeting will take place at 4 p.m., April 3 at the Great Northern Hotel Conference Room in Malta. Escapee from Great Falls pre-release center has ties to Valley and Roosevelt County. 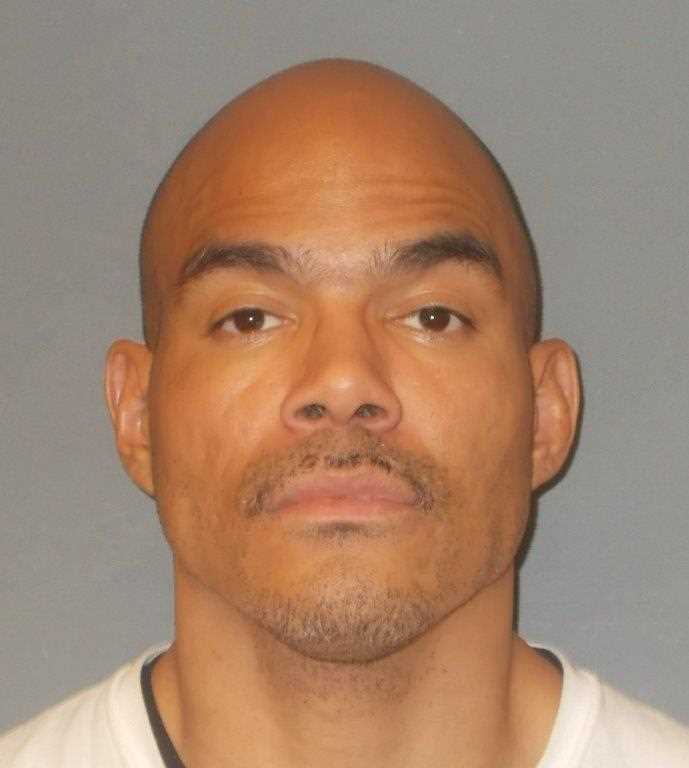 Joseph Hanville Jones III escaped from the Great Falls pre-release center 03/20/19. He was serving a 5-year sentence for criminal distribution of dangerous drugs and has a prior felony conviction for domestic violence. Jones is a 45 yr old black male with a shaved head. He is 6' 2" tall and weighs approximately 210 lbs. Jones has ties to Roosevelt and Valley Counties and may be in the area. If you have any information on his whereabouts, please call 911. For your safety do NOT approach Jones. WILLISTON, N.D. - Williston Police say a woman accused of severely injuring a 2-month-old baby in her care in November has been arrested in Montana. Police say on Nov. 6, 2018 the parents of the baby dropped her off at the home of 23-year-old Corey Gardner, who was providing unlicensed daycare services. When the baby's parents picked her up from daycare, officers say the baby was unresponsive and had to be taken to a Bismarck hospital due to respiratory issues and seizures. Court documents show the child was transferred to the Children's Critical Care Unit in Sioux Falls South Dakota, where staff determined the baby had sustained bone fractures, swelling of the skull, lack of oxygen to the brain, bleeding in her brain, ligament strains near her spine and retinal hemorrhages. Police say Gardner told them the baby had a cold and was fussy, and while doing "tummy time" the baby started screaming. Gardner told police she put the baby down for a nap in her room and denied any accidental trauma. Law enforcement officers say 10 days after the baby was injured, the Gardners broke their lease and left town. Gardner is currently incarcerated in the Valley County Detention Center awaiting extradition. HELENA — After three failed attempts in previous sessions, a bill that would prevent minors from using tanning beds is moving through the Legislature. Sen. Roger Webb, R-Billings, is sponsoring Senate Bill 21, which passed the Senate 26-24 in February and had its first hearing in a House committee Friday. Dr. Charlotte Kutsch with the Montana Academy of Dermatology, who was one of 10 supporters of the bill during its hearing, said minors who use tanning beds have a greater chance of getting melanoma. “And the science is clear. If you use indoor tanning beds, your risk of developing skin cancer significantly increases. No amount of UV exposure from tanning beds is safe. By definition a tan is evidence of skin damage,” Kutsch said. According to the state health and human services department, 240 Montanans are diagnosed with melanoma every year. S.K. Rossi with the ACLU was one of three opponents to the bill. Rossi agrees tanning beds should have more regulations, but says penalizing tanning facilities with up to a $500 fine, as well as 6 months jail time, is too severe. “We just don’t think this should be in the criminal code. It seems a little harsh to put a business owner in jail for up to six months for— possibly accidentally— letting a minor use a tanning bed,” Rossi said. Glasgow resident Leighton Hughes was found guilty in State District Court this week on one felony count of possession of methamphetamine. On June 22nd of 2018, Hughes was arrested at his residence at 1002 5th Avenue South in Glasgow by the Glasgow Police Department. Hughes was originally arrested for a misdemeanor outstanding warrant when during the arrest, officers with the GPD found suspected methamphetamine on his person. Officers also found that methamphetamine was being used in the home and obtained a search warrant for the home. Officers with the Glasgow Police Department and Montana Department of Justice DCI searched the home on June 23rd. As a result of the search, Hughes was originally charged with 6 felony drug charges and 2 misdemeanor drug charges. The misdemeanor charges include criminal possession of dangerous drugs-marijuana and criminal possession of drug paraphernalia. 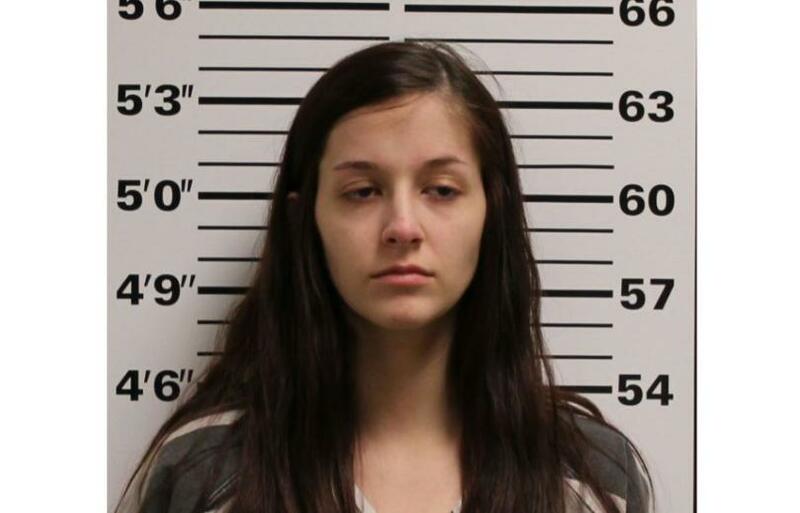 Valley County Attorney Dylan Jensen told Kltz/Mix-93 News that Hughes was only tried on the possession of methamphetamine charge due to the fact that the other charges were dismissed by Jensen. Jensen said he dismissed the charges after an adverse suppression hearing ruling that made the evidence relating to the operation of the lab as inadmissible. Hughes will be sentenced on May 6th. Glasgow Police Chief Brien Gault told Kltz/Mix-93 that 34-year old Joey Mcgauvran of Chicago, Illinois has been arrested after allegedly starting a fire in a motel room at the LaCasa Motel in Glasgow. The Glasgow Fire Department and the Glasgow Police Department were called to the LaCasa at 5:11am Thursday morning and found a motel room on fire. No injuries were reported but the motel room was gutted and there was smoke and water damage to several other rooms at the LaCasa. Mcgauvran was arrested and is currently incarcerated at the Valley County Detention Center. He apparently was booted off the Amtrak train on Wednesday and had been causing problems around Glasgow that evening before allegedly starting the fire at the LaCasa early Thursday morning. BILLINGS, Mont. (AP) — A Montana man has admitted to charges in the death of one of his passengers after he drove drunk and caused a single-car rollover. The Billings Gazette reports 32-year-old Andrew Preston Martell, of Wolf Point, pleaded guilty Monday to involuntary manslaughter in U.S. District Court. There is no plea agreement in the case. Martell was driving on Oct. 1, 2018, with his girlfriend and another woman as passengers. The government's offer of proof says Martell drove off a straight county road on the Fort Peck Indian Reservation, and came to rest in a ditch. A crash investigation shows the car rolled end over end, landing on the driver's side and trapping all three occupants. The fire department had to extricate each person, but 33-year-old Krystal Karol Brown died at the scene. The National Weather Service in Glasgow has issued a Flood Warning for snowmelt in East Central Phillips County and West Central Valley County. until 2:45 a.m. MDT Saturday. At 2:48 a.m. Friday, reporting gauges indicated flooding on Beaver Creek due to snow melt. The gage west of Hinsdale has risen to 16.6 feet at 230 am. Ice jams are also possible. Flooding is also occurring on Larb Creek south of Saco. Some locations that will experience flooding include Saco and Hinsdale. The youth classroom course will be held at the Hill County Electric Training Room in Havre. All registrants for the classroom course must be 11 years of age by April 22. To hunt during the archery only season, youth need to be at least 12-years old by January 16, 2020. For the adult online field course, adults must pass the online bowhunter education course and receive a Field Day Qualifier Certificate. This Field Day Qualifier Certificate and a picture ID are necessary to obtain entrance into the field course. The adult field course will be held from 8 a.m.-12 p.m. on Saturday, April 27, also starting at the Hill County Electric Training Room. Both classroom students and adults need to pick up the “Today’s Bowhunter” manual from the FWP office in Havre. Students are to read each chapter and complete all chapter review exercises before the start of class. To register and learn more about the bowhunter education classes offered, please go to the FWP website at www.fwp.mt.gov and look under the “Education” tab. If there are any questions, please call course coordinator Nick Siebrasse at 406-390-0402. HELENA, Mont. (AP) — A legislative committee heard testimony on a bill that would legalize sports gambling in Montana as long as the betting was done in bars with full liquor licenses. The USDA Natural Resources Conservation Service in Montana is accepting applications for the Agricultural Conservation Easement Program (ACEP) Wetlands Reserve Easements. “Easements are sometimes a perfect fit for a landowner who is looking to protect his or her land from future development or to protect and improve wetlands or provide critical habitat for wildlife,” said Erik Suffridge, NRCS assistant state conservationist for easement programs in Montana. Wetlands reserve easements allow landowners to successfully restore, enhance and protect habitat for wildlife on their lands, reduce damage from flooding, recharge groundwater and provide outdoor recreational and educational opportunities. Eligible landowners can choose to enroll in a permanent or 30-year easement. Tribal landowners also have the option of enrolling in 30-year contracts. To learn about ACEP and other technical and financial assistance available through NRCS, visit your local USDA Service Center or www.mt.nrcs.usda.gov . Valley County Sheriff Tom Boyer has announced that after careful consideration he has named Chris Richter as Valley County Undersheriff. Richter is a veteran officer in the VCSO. Richter has been employed with the Valley County Sheriff's Office for the past 5 years and also worked 8 months with the Great Falls Police Department. Sheriff Boyer has operated without an Undersheriff since taking over as the top law enforcement officer in Valley County on January 1st. Boyer told Kltz/Mix-93 that he is excited about the future of the VCSO and Deputy Richter will be an excellent leader to work with. In a Friday ruling, a two-judge panel said Morris carefully considered all factors in his decision to prevent the company from working on the proposed 1,184-mile (1,900 kilometer) pipeline from Alberta to Nebraska. The Glasgow School Board has voted to put a General Fund Levy request on the May 7th ballot in the amount of $104,074. If approved by voters this would be used to increase teacher and support staff wages. Passage of this proposal would increase the taxes on a home with the market value of $100,00 by approximately $8.91 and on a home with a market value of $200,000 by $17.82. Voters in the Glasgow School District have rejected the last 3 General Fund Levy requests made by the Glasgow School Board. In 2018 voters rejected the levy request by a vote of 808-986. With warmer temperatures expected, spring snowmelt season is quickly approaching. We at the National Weather Service wanted to take this opportunity to remind folks of things they can do to prepare themselves for the upcoming spring runoff/flooding season. Consider buying flood insurance if you don’t have an active policy, especially if you live in a flood prone area. Policies generally take effect 30 days after purchase, so the time to get a policy is now. Visit https://www.fema.gov/national-flood-insurance-program for more information from FEMA on the National Flood Insurance Program on options available to you. Make sure snow and ice is cleared from drains, window wells, ditches, and culverts under driveways. Creating a flow path for runoff away from your home/property is one of the best ways to prevent flooding or other water drainage related issues. Due to frigid temperatures in February and the first half of March, rivers and streams across the area have rapidly accumulated thick ice cover. The possibility for river flooding due to ice jams has increased substantially in recent weeks and will remain elevated for weeks to come. Follow the National Weather Service in Glasgow for current, up-to-date information on our website at www.weather.gov/Glasgow as well as Facebook and Twitter. If you have photos, videos or questions related to ice jams or flooding, please e-mail the Glasgow Weather Service at ggw.wxreport@noaa.gov. HELENA — Rep. Joel Krautter, R-Sidney, said Montana’s urban counties are rapidly expanding and spearheading the state’s economic growth while rural counties are being left behind. “But for Montana’s other 44 counties—our rural areas—we are seeing a population flatlining. Where are we going to be in 15, 20, 30 years? Are we just going to be a state of seven urban booming areas and 44 ghost counties?” he said. Krautter is sponsoring House Bill 405, which would appropriate about $1 million from a special state fund every year in grants to bring skilled workers into rural areas. The bill had 12 supporters and no opponents when it was heard before the House Business and Labor Committee Monday. Those residents in the Glasgow School District who are interested in being a candidate for the Glasgow School Board have until March 28th to file the necessary paperwork. There is one 3-year term available on the Glasgow School Board with the election set for May 7th. The incumbent is Mona Amundson who is completing a 3-year term as Trustee. As of last week there were no candidates for the position. MONTANA – Governor Steve Bullock today announced that Montana’s unemployment rate ticked up to 3.8% for the month of January, up 0.1 percentage points from December, likely reflecting impacts from the federal government shutdown. The national unemployment rate also increased by a tenth of a percentage point up to 4.0%. Total employment, which includes payroll, agricultural, and self-employed workers, indicated a small increase of 229 jobs in January. Payroll employment indicates a small decline in employment, with declines in federal government and professional and business services. The low changes in employment levels likely reflect decreased economic activity during the January federal government shutdown. In addition, the Department of Labor & Industry has released revised and updated statewide unemployment and employment growth numbers for the previous five years. Unemployment rate and employment estimates are revised each year in February in a process called benchmarking, which typically results in more accurate estimates and a smoother data series. Updated estimates suggest employment growth of 0.8% for 2018, or roughly 4,250 jobs. This employment growth rate is slightly slower than in previous years, but paired with continued output growth, simply reinforces that Montana businesses are struggling to find sufficient workers to support growth. Montana’s preliminary GDP estimates suggest growth faster than the U.S. during 2018. The Consumer Price Index for All Urban Consumers (CPI-U) was unchanged in January, with a decline in the energy index offsetting increases in other items. Gasoline prices decreased by 5.5% over the month. The index for all items less food and energy, also called core inflation, increased 0.2% in January. A Glasgow man was found by search and rescue personnel Monday morning after being reported missing on his snowmobile on Sunday. Valley County Sheriff Tom Boyer told Kltz/Mix-93 that the man was found southeast of the Cox Ranch in Phillips County after being reported missing after shed hunting in the area. Boyer said that the man is reported to be ok but is being transported to FMDH to be checked by medical personnel. The man spent the night on his snowmobile with temperatures at 0 degrees. Valley County Search and Rescue was instrumental in finding the man according to Sheriff Boyer. As of February 28, 2019, 206 cases of measles have been reported to CDC from 11 states. There currently are no cases of measles in Montana. Most cases in 2019 are part of a large outbreak in Clark County, Washington. Given the proximity of this outbreak to Montana, we may have travelers to and from the area, which could increase the risk of exposure to Montana residents. Measles is an extremely contagious virus that can be dangerous, especially for young children. The measles virus can survive in a room for up to two hours after an infected person leaves the space. If exposed to the virus, anyone who is not immune is likely to get measles. Public health authorities are recommending a proactive approach to prepare for the possible introduction of measles into our state. One important activity includes reviewing the immunization status of staff and students. While immunizations are required for students, unless a medical or religious exemption is on record, there are no immunization requirements for staff members. ?• You are a school-age child (K-12) who has had two measles vaccines (MMR - measles, mumps, rubella). ?• You were born before 1957, or have received at least one-dose of measles vaccine. ?• You have had measles disease (diagnosed by a health care provider and confirmed with a lab test). ?• You have had a blood test that shows you are immune to measles. case impacting your school. If a confirmed measles case impacting your area is identified, recommendations may include post-exposure prophylaxis, and unvaccinated staff or students may be excluded from school until the risk of measles has passed or the individual receives a dose of MMR vaccine. In the event a case of measles is suspected or confirmed, public health officials will help determine key response activities necessary to confirm the illness and/or guide the response to potential exposures. In addition, measles communications to students and parents/guardians should be coordinated with your local public health department to avoid potential issues with inconsistent information or instructions. Several instances of miscommunication have already occurred based on rumors and incorrect information being shared regarding “measles” cases. These issues can be avoided by speaking to your local public health department. Please be sure to have your local public health agency contact information readily available. Up to date information on measles activity can be found at the DPHHS website. Visit www.dphhs.mt.gov and select the measles banner to access our updates. In the event of a case in Montana, we will immediately update the website and issue a Health Alert Network (HAN) Advisory through your local public health department. Thank you for your help to ensure that our students stay healthy and safe! U.S. Senator Jon Tester is pushing back on U.S. Customs and Border Protection’s (CBP) recent proposal to cut hours of operation at four of Montana’s 16 ports of entry, limiting trade and travel across the northern border. In a letter to CBP Commissioner Kevin K. McAleenan, Tester called the agency’s plan to slash hours at the Morgan, Opheim, Raymond, and Scobey Ports of Entry “disappointing” and noted that its consequences would disproportionately affect rural America. Under CPB’s proposal, the Port of Raymond—which is currently open 24 hours—would be closed between the hours of midnight and 6 a.m. The Port of Scobey—which is open from 8 a.m. – 9 p.m. between June and September to accommodate increased travel in the summer—would be open from 8 a.m. – 6 p.m. year-round. And the Ports of Morgan and Opheim—which are open from 8 a.m. – 9 p.m. in the summer—would be open from 9 a.m. – 6 p.m. year-round. Tester has repeatedly beat back proposals by CBP to cut hours of operation at Montana’s Ports of Entry. In 2016, after more than a year of advocacy, Tester successfully convinced CBP to scrap its plan to cut the hours of operation at the Port of Raymond, one of only three 24-hour ports in the state. As Ranking Member of the Homeland Security Appropriations Subcommittee, Tester also fought to secure funding for 600 additional border patrol agents in last month’s budget deal. Influenza is spreading in our community. It's important for everyone to know that if you have symptoms or have tested positive for Influenza A or B, you can be contagious for up to 5-7 days (adults and children), you can shed the virus over a period of 7 days. Please be cautious returning to work and/or school. If you or your child are presenting symptoms of fever, fatigue, cough, or sore throat, stay home to prevent influenza from spreading. The State of Montana reports there have been 14 confirmed cases of Influenza in Valley County. Montana House passes legislation allowing people on probation or parole in Montana to use medical marijuana. HELENA, Mont. (AP) — The Montana House passed a bill to allow people on probation or parole to use medical marijuana if they suffer from a debilitating medical condition. The bill sponsored by Democratic Rep. Jade Bahr passed 60-39 Friday before lawmakers took their mid-session break. The bill moves to the Senate. Bahr argued on the House floor that Montana residents have twice voted in favor of allowing the use of medical marijuana and that people on probation or parole wouldn't be denied access to other prescribed treatments such as chemotherapy, insulin or dialysis. A 2011 bill that sought to put tighter restrictions on the medical marijuana industry said people on probation and parole couldn't hold medical marijuana cards. Local Legislators all voted for HB 498. State Representative Casey Knudsen, Rhonda Knudsen and Bridgett Smith all voted for the legislation which will now move to the State Senate for consideration. .
High school seniors with plans to attend a trade school are encouraged to apply for the Feda Scholarship for the Trades. Applications will be accepted through April 19. The scholarship is administered by the Valley County Community Foundation. All applicants must be residents of Valley County. First-time applicants must be graduating from a Valley County high school this spring or receiving a home school certificate or a GED and pursuing a post-secondary education in the trades. In addition, students who have received a Feda Scholarship previously may apply for a second scholarship, providing they have successfully completed one semester of study. Applicable course work includes, but is not limited to plumbing, electrical, drafting, mechanics, welding, carpentry, medical technology, computer technology or criminal justice. All Valley County high schools have information on the scholarship requirements and applications. They are also available on the VCCF website: www.valleycountycf.net. VCCF will accept only paper copies of the applications. They must be postmarked by the deadline of April 19. Late or incomplete applications will not be considered. Sam Waters of Glasgow chairs the scholarship committee for the VCCF. Contact him at 228-8231 for more information. Montana Fish, Wildlife and Parks honored the service of its Region 6 Hunter and Bowhunter Education volunteer instructors at the annual workshop, which was held on Sat., Feb. 9 in Glasgow. The workshop is an annual event that invites all the volunteer instructors across the region for a day filled with visiting, updates to the program, demonstrations of new equipment and ideas, and most importantly, honoring years of service. Receiving awards at this year’s workshop were numerous instructors with service ranging from 5 to 25 years (please see the list below). All service award recipients receive a plaque, with other milestones receiving special awards, including: 10 year, an engraved knife and 20 year, an FWP belt buckle. Highlighting this year’s awards were Gifford Fjeld of Hinsdale, who has been a hunter education instructor for 20 years, and Donald Holden of Havre, who has been a hunter education instructor for 25 years. FWP is thankful to have hundreds of qualified instructors across the state, and always welcomes new additions. For information on becoming a Hunter or Bowhunter Education instructor in Region 6, please contact Marc Kloker at 406-228-3704, or go to the website at fwp.mt.gov/education/hunter/instructors/ to learn more and apply. Feb 2019 in Glasgow averaged -3.4 degrees making it the 2nd coldest Feb, and 8th coldest month on record. It was 22.6 degrees below normal. It was the coldest month since Jan 1982 and first month to average below zero since Jan 1996. It was also the snowiest February on record and 5th snowiest all time with 28.2 inches. Montana Legislature considers legislation that would loosen restrictions around requirements for vaccinations. The Montana Legislature is considering a handful of bills that would loosen restrictions around requirements for vaccinations. Last month, nearby Washington state declared a state of emergency after 66 people there were diagnosed with measles. Three cases of mumps were confirmed in Bozeman just two weeks ago. Vaccinations protect against both diseases. Many people who testified Monday in support of the bills said their children had suffered harm after being given routine childhood vaccinations or said they had suffered after receiving vaccinations as a child, adding their opposition should not be looked at through the lens of what's happening in other states. Opponents to the bills said children who are not vaccinated for religious reasons put those who are too young or medically unable to be vaccinated at risk, pointing out diseases are just a car ride away. The Centers for Disease Control and Prevention says vaccines help protect against serious diseases. Vaccination also prevents disease from spreading to others, according to the CDC. All vaccines go through testing with the CDC and federal Food and Drug Administration. While severe or long-lasting side effects are rare, there are sometimes minor side effects that are short-lived, such as soreness where the shot was given, according to the CDC. Two of the bills are carried by Rep. Theresa Manzella, R-Hamilton. House Bill 575 would prohibit day cares from denying enrollment to children whose parents have religious exemptions to vaccines. State health department rules say a Montana day care facility must be provided with documentation a child has been immunized with a basic childhood series. It allows medical exemptions. Corrie Meza, who is co-leader of Montanans for Vaccine Choice, said she had to quit her job because no licensed day care facility would accept a religious exemption for her children. Hannah Danzer, who runs a Helena day care facility with 50 children, opposed the bill, saying it put children under her care in danger, especially children too young to be vaccinated or those who can't be for medical reasons. "By passing this bill you make keeping them safe even harder to do," Dozer said. House Bill 574 also deals with religious exemptions and would stop the health department from prohibiting foster families to take in children if one of their own children is not vaccinated because of a religious exemption. This is also in a department rule that Manzella says goes beyond the scope of what the Legislature intends. Manzella also said with a record number of children needing foster care, the state should not be limiting places they could be placed. Rep. David Dunn, a Republican from Evergreen, is carrying House Bill 564. All 3 bills cleared the House Judiciary Committee on Wednesday and will now go to the full House for consideration. Senate Bill 23, from Sen. Keith Regier, R-Kalispell, says employers must accommodate employees who do not get vaccinated for religious or medical reasons, along with any other reason. Regier's bill cleared the Senate on a 29-20 vote and will have a hearing in the House Judiciary Committee. Senate Bill 99, from Sen. Cary Smith, a Republican from Billings, would require that when schools communicate to parents or guardians about immunizations, they must provide information about exemptions. It is likely dead after a failed 24-25 vote in the Senate. Murphy said Montana already requires fewer vaccines than in other states. And while others who supported the bills insisted repeatedly what was happening in Washington had nothing to do with Montana, "that's pretty close. That's just a car ride away, not a plane ride away." (U.S. Senate) – As part of his ongoing support for early childhood education, U.S. Senator Jon Tester today announced $1.1 million in funding for Eastern Montana’s Head Start program. The funding, which comes from the Administration for Children & Families, will help fund Action for Eastern Montana’s Head Start program this year. The program serves around 150 children from Malta, Glendive, Miles City, Glasgow and the surrounding communities each year. Tester has been an ardent supporter of Head Start, which provides educational, nutritional, and social services to help children hit the ground running in kindergarten and beyond. As a member of the Senate Appropriations Committee, Tester worked with Republicans and Democrats to secure more than $10 billion for the program this year. He also recently announced $2.8 million for Head Start in Missoula and $2.2 million for Helena-area Head Start programs. HELENA, Mont. — As winter weather continues to dump large amounts of snow throughout Montana, Insurance Commissioner Matt Rosendale is advising Montanans to consider flood insurance and start preparing for floods right now, before it’s too late. Flood insurance policies typically do not take effect until 30 days after purchase, so people should plan ahead for properties at risk of flooding. “As we saw last year in Missoula, Helena, and other places, flooding can wreak havoc on people’s homes and other property. Because of the waiting period on flood insurance policies, everyone needs to be looking at their options right now, before the weather warms up,” Rosendale added. Flooding is the number one natural disaster in the United States and there are many misconceptions about flood insurance. There is no guarantee that floods will be declared a disaster to open up federal assistance. Most homeowner’s policies do not cover flood insurance, and about 20 to 25 percent of all flood claims come outside of a high-risk flood area. Just a few inches of water can cost thousands of dollars in damage to walls, floors, furniture, carpets and other personal property. The average flood claim in Montana is nearly $13,000. Statistics indicate there is a one-in-four chance that a homeowner will experience a flood over a span of 30 years. 25 percent of flood insurance claims come from moderate to low risk flood areas. More information on the available options for flood insurance is available on the CSI website here. For a more comprehensive overview of flood insurance, visit www.FloodSmart.gov . HELENA — The Montana Senate voted unanimously Monday to advance a bill that would allow EMTs and paramedics to offer community health care in non-emergency situations. Bob Drake, Tri-Lakes Volunteer Fire Department fire chief, supported Senate Bill 38 during its public hearing in January. He said his volunteer-only department often responds to emergency calls that drain resources and wouldn’t happen if they were able to offer care beforehand. “We don’t have the ability to be proactive. We’re always being reactive, and reactive costs way more money. And it costs us in volunteer hours that we just don’t have,” he said. The bill’s sponsor, Sen. Margie MacDonald, D-Billings, said remote communities with far-away hospitals can expanded already-burdened emergency rooms. She said EMTs and paramedics could offer expanded medical services if they weren’t restricted to only responding to emergency calls. “Particularly in rural areas, we can get some services to people and keep them out of the emergency room. Right now, this group of folks is prohibited from doing anything except moving someone from an emergency to the emergency room.,” MacDonald said. The bill will face another vote in the Senate before it moves to the House. Montana Fish, Wildlife and Parks Region 6 game wardens affirm that due to good people coming forward with good information, the individual responsible for the two bull elk killed in Blaine Co. last week has been identified and interviewed. Charges are pending in the case. Region 6 wardens would like to thank the public for their TIP-MONT phone calls, comments, and Facebook shares, and would also like to thank media outlets for helping to spread the word on this crime. On Feb. 14, 2019, Region 6 Havre wardens had received a TIP-MONT call about a dead bull elk approximately two miles north of Cow Creek Reservoir off Lloyd Road in Blaine Co., about 30 miles south of Chinook. Wardens responded to the area and located a seven-by-seven bull elk. Another dead six-by-six bull elk was then found nearby. 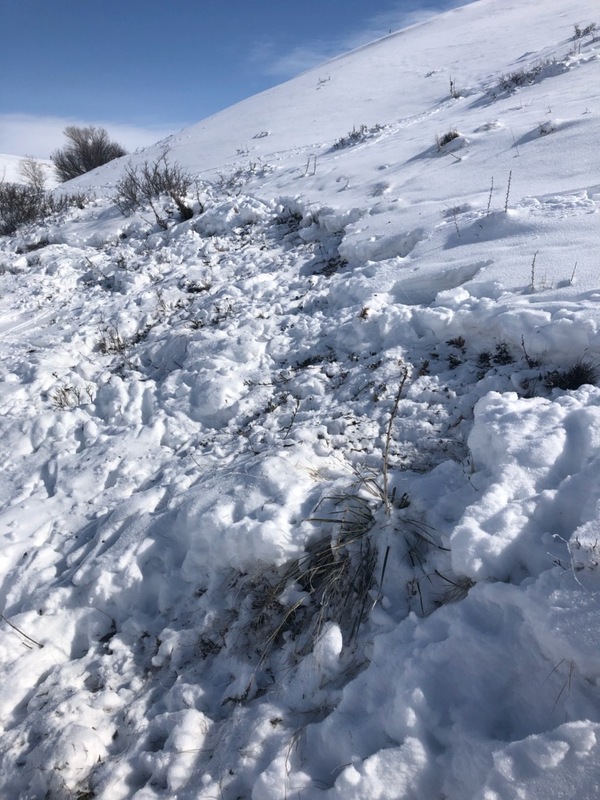 Wardens determined both elk were shot and left to waste on the hillside, and continued the investigation while seeking help from the public for information. Late winter is a difficult time for wildlife. After using fat reserves through most of the winter, along with trying to find what food is available, many animals are at their most vulnerable. In addition, this has been a snowy and cold late winter along the Hi-Line. That’s why Montana Fish, Wildlife and Parks, along with the Bureau of Land Management (BLM), are asking shed hunters and other recreationists to give wildlife their space until the snow melts and the animals are less stressed. Shed hunting – looking for antlers shed each year by male members of the deer family – has become increasingly popular and competitive in recent years. Shed hunting is a good way to get some fresh air and exercise and is encouraged as an activity. However, shed hunters, along with snowmobilers, skiers, and snowshoers should avoid areas where deer, elk and antelope are currently wintering. It is safest to admire these animals at a distance. Like any activity, shed hunting requires permission of the land owner/agency and special rules may apply. For instance, the BLM is especially concerned that mule deer wintering areas, such as the Bitter Creek Wilderness Study Area (WSA) in northern Valley Co., are targeted for shed hunting with snowmobiles. Snowmobiles are not permitted off-road in the Bitter Creek WSA, and folks who are violating this law will be fined. Please know the rules of public land agencies regarding winter recreation, and always ask permission on private land including property that is in Block Management. It seems like there is almost no end in sight to February, 2019, with record snowfall and record low temperatures across the Hi-Line. When wildlife experience these conditions, they will often seek new areas for shelter and food resources, many times near residences or communities. With the best intentions, concerned members of the public may feel the obligation to feed wildlife in these difficult conditions. However, it illegal to knowingly feed wildlife (particularly deer, elk, antelope, moose, wild turkeys, bears and mountain lions). It is also illegal to continue to “attract” animals by failing to properly store attractants such as garbage, dogfood, bird seed, grain, etc. · Supplemental feeding encourages wildlife to become dependent on handouts that are not part of their natural diets. · Human foods and livestock feed are usually nutritionally inadequate for wildlife and may lead to subsequent health problems. · Young animals that are taught to depend on humans sometimes never develop normal foraging behavior and could starve if the artificial food sources are removed. · Wildlife lose their fear of humans and learn that they can boldly forage for human food. Consequently, conflicts, nuisance behavior, and risks to human safety are sure to occur. · Wild animals being fed by humans may congregate in unnaturally high numbers, and this is the perfect opportunity for diseases, such as CWD in deer, to spread. · Artificial feeding increases wild animal populations, which in turn increases stress. Such stressful conditions increase the incidence of fighting and injury among animals. · Feeding wildlife, especially prey species such as deer, squirrels and rabbits, often causes a domino or food chain effect. Due to such feeding, the prey densities increase, which in turn attracts predators such as coyotes, bobcats and mountain lions. Please do your wildlife friends a favor and let them get through winter on their own. These animals have adapted to survive these types of winter conditions, and likely will be just fine. Friday, February 15, due to the snowy road conditions in St. Marie, the school buses that service that area released students as close to their homes as possible, not at designated stops. We apologize for the lack of communication on the District’s part. These commitments are for all routes that the school district travels. -make sure the superintendent and principals are aware that alternative stops are being utilized. -make sure we will have contact information for all students on each bus. -attempt to contact parents/guardians/emergency contact prior to changing the drop off area. If we cannot contact the parent/guardian, we will bring the students back to the Central Office/Bus Barn. We contact parents/guardians/emergency contact to pick up their children at the Central Office/Bus Barn. -we will drive the routes prior to releasing buses to get a visual on the roads, if we are aware of a snow storm. -Please make sure your contact information is up to date with your child’s school. This includes emergency contacts, so we can have a secondary contact for your child. -If you have weather come into your area, please contact the bus barn (228-9222), Central Office (228-2406), Irle (228-2419), Middle School (228-8268), or the High School (228-2485). -Please make sure your child, all ages, is dressed appropriately for the weather. It takes a village to raise a child. If you see something that we should address, please be proactive and contact the district. Our routes go from St. Marie to western Fort Peck area to the county roads towards Tampico. We appreciate any proactive communications. 5TH AVE AND BUS 10 WILL PICK UP AND DROP OFF AT CEDAR AND 5TH AVE.
On March 9, 2019 the Missouri/Milk River Chapter of Ducks Unlimited will once again be holding its annual fundraising banquet at the Cottonwood Inn with doors opening at 5:30 P.M. We hope to begin serving dinner by 6:45 PM. This year’s March banquet will be somewhat different than banquets of past years. As you know, we have over 90 Sponsors of our Chapter. These are people or businesses who donate at a minimum $250 to the DU Conservation Cause. The $250 sponsorship conserves, enhances and protects 1 acre of Wetland Habitat. Previously, we held one HUGE banquet at the Cottonwood Inn at an overflow capacity. This event on March 9th will be a “Sponsor Only” event with the traditional sit down served Prime Rib Dinner. This event will provide a Live Auction, Silent Auction and a limited number of gun raffles. You are receiving this email as your invitation to this event. Though we would like for all attendees to be sponsors, we realize that there will be logistics to work through in terms of attendance. If you have invited others in past years to attend the event with you, you are welcome to do so for this event hoping that you will encourage them to become sponsors as well. As a sponsor, you will still receive a small gift compliments of DU and a 1:5 chance to win off of the Sponsor Table (which includes guns). We would like to thank you in advance for your consideration this year. Hopefully, you will be able to support this cause again with your donation. Please invite someone to become a sponsor at this year’s event!! If you would like to attend this event and become a 2019 sponsor with the Missouri/Milk River Chapter please click the "Buy Tickets" button below and purchase your tickets online right now OR call Ken Jansa at (406) 228-2031 or (406) 263-8030 for your tickets today! Please join us at the Missouri Milk River (Glasgow) Sponsor Banquet on Saturday March 9th, 2019. To purchase your tickets online please click the Buy Tickets link below. 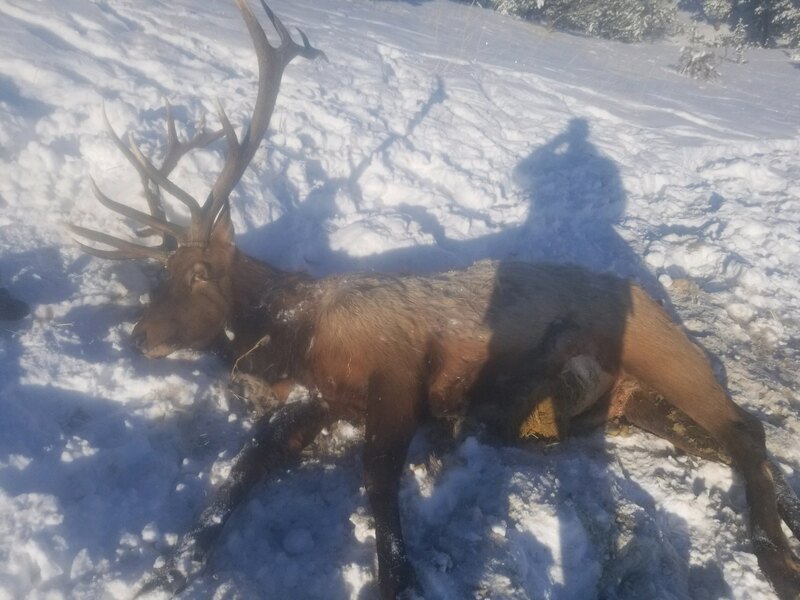 Montana Fish, Wildlife and Parks Region 6 game wardens are seeking any information regarding a two dead bull elk found south of Chinook in Blaine Co. last week. On Feb. 14, 2019, Region 6 Havre wardens received a TIP-MONT call about a dead bull elk approximately two miles north of Cow Creek Reservoir off Lloyd Road in Blaine Co., about 30 miles south of Chinook. Wardens responded to the area and located a seven-by-seven bull elk. Another dead six-by-six bull elk was then found nearby. After further investigation, wardens determined both elk were shot and left to waste on the hillside. Wardens are reaching out to the public for any information about the person or persons responsible in this wanton waste of two bull elk. This is not hunting, this is a crime that occurred well outside of established hunting seasons. These elk are believed to have been shot anywhere from Sunday, Feb. 11 to Wednesday, Feb. 13. Anyone with information about this crime is encouraged to call Chinook-area Warden Haden Hussey directly at 406-942-2191 or call FWP’s 24-hour wildlife tip line at 1-800-TIP-MONT (1-800-847-6668). The 1-800-TIP-MONT program is a toll-free number where one can report violations of fish, wildlife or park regulations. Callers can remain anonymous and may be eligible for a reward up to $1,000 for providing information that leads to a conviction. For youth to be eligible to hunt and be fully certified during the 2019 season, hunters must be 12-years old by January 16, 2020. Students aged 10 and 11 can take a course and hunt as an apprentice, but will not be fully certified until the year they turn 12. Preference will be given to 11 and 12-year olds (or older) if the class becomes full. All registrants for these events must be 10 years old by the first day of class. For the adult online field course, adults must pass the online hunter education course and receive a Field Day Qualifier Certificate. Adults looking to complete the online course can find instructions at fwp.mt.gov . The Field Day Qualifier Certificate and a picture ID are necessary to obtain entrance into the field course. Montana livestock producers are reminded to keep updated livestock inventory records. These records are necessary in the event of a natural disaster. When disasters strike, the USDA Farm Service Agency can assist producers who suffered excessive livestock death losses and grazing or feed losses due to eligible natural disasters. For more information on documentation requirements, contact your local FSA office at 406-228-4321 Ext. 2 and at 54059 Highway 2 in Glasgow. For more information you can also visit www.farmers.gov/recover. As winter continues and the 2019 calving season near or underway, the USDA Farm Service Agency reminds Montana livestock producers about the importance of record keeping and reporting your livestock losses to FSA within 30 calendar days of when the loss of livestock is apparent. A Notice of Loss can be filed with FSA via email, phone, fax or office visit. For more information on the Livestock Indemnity Program and other disaster programs, contact your local FSA office today at 406-228-4321 Ext. 2 and at 54059 Highway 2 in Glasgow. For more information visit online at www.farmers.gov/recover . For more information on the livestock indemnity program and other disaster programs, contact your local FSA office today.